. In Oxy-gen choose "PHP-MySQL" as output format.
. You can access to the option panel by clicking on the Options buton.
. In the century page, it is not necessary to specify a date to limit the information, this will be handled later.
. Modify the file lib_inc.php by replacing the login strings to access the MySQL server correctly. You must complete the following variables: $ server, $ login, $ password and $ mydatabase.
. Put files generated on the website through an FTP transfer software.
. Get on the admin/index_admin.php with explorer and run each, or just the first links to load the base automatically.
. Once all the bases are loaded, in the same menu, you must go to "Set the table users". You can then create the administration user account. Caution: Make sure to memorize the information entered.
. The next step is to click "Filtering individuals" in the same administration menu page.
. This step allows filtering of the people in your database based on a year of your choice. 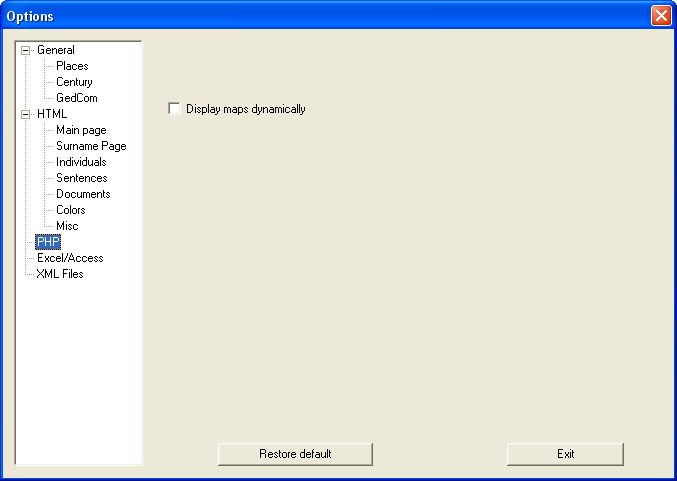 Of course you can also leave visible all individuals.
. You can return to this menu at any time to change your choice. We must then put everyone in public access and redefine a date filter.
. Now you can navigate your site php. A left of the homepage, you have a button "Private" in the upper right, which allows users to authenticate and access the hidden data.
. Click here to see a description of the MySQL database.
. Both tables oxg_param and oxg_ref_param are created to manage themes. Just create new file menu3.php, oxygen3.css and oxygen_print3.css, add a line in oxg_ref_param (with PHPMyAdmin for example) and then you can select the theme you want in the admin menu. So you can create themes 4, 5 ... You can send me your compositions, I'd be happy to integrate them into Oxy-Gen package. In the main panel of the converter Oxy-Gen, you can check the option "Process all files in the directory". Thus you can upload multiple files at once. To load a new family, you must restart Oxy-Gen on the new gedcom. You then upload only the contents of the admin. You can start the 'Automatic loading of the entire database, which will add only the new family. In the admin page of the PHP version, you can delete a family (corresponding to a gedcom file).